DANCE supremo Shobana Jeyasingh was presented with a Women of the World (WOW) Creative Industries Lifetime Achievement Award, yesterday (March 7). 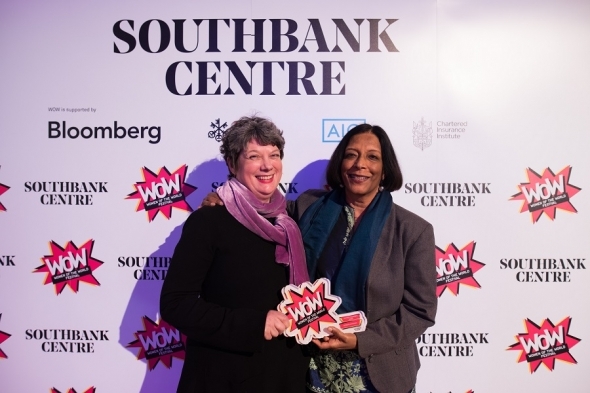 The awards were presented as part of the opening day of the Women of the World Festival, which runs at the Southbank Centre in London, until Sunday (March 11), celebrating and spotlighting women across art, politics, and business with talks, events and performances, supported by Bloomberg. ‘Configurations’ was her first choreographed piece and has the clear and central influence of Bharatanatyam, the South Indian dance form she trained in, and has popularised both in Britain and globally. The second ‘Strange Blooms’ illustrated her evolution as an artist of incredible range and power – mesmerising, beguiling and beautiful, it still sticks in the memory and shows her engagement with western contemporary dance and her originality, in blending cultures and traditions to create something new and brilliant and incredibly dynamic. The same could be said of ‘Bayadère – The Ninth Life’, a reworking of a 19th century classical and rather orientalist (in the sense of fetishising and exoticizing ethnicity) ballet, Jeyasingh contemporised it and made it speak in volumes to a modern, multi-cultural (global) audience. It premiered at Sadler’s Wells in October. (See links below to review and interview with Jeyasingh about the work). She was presented with the award by writer, arts editor, broadcaster and critic Sarah Crompton (pictured above with Jeyasingh). Novelist, editor and activist Nikesh Shukla was among this year’s Women of the World Festival Awards’ judges. He presented another Lifetime Achievement Award to Lennie Goodings, the founder of publishing company, Virago. Elsewhere, Asian nominees didn’t make it to the winning podium, sadly but black journalist Reni Eddo-Lodge won the Bold Moves Award for her debut book, ‘Why I’m No Longer Talking To White People About Race’. Asian dance creative powerhouse Mira Kaushik of the 40-year-old plus Akademi organisation missed out on a Fighting the Good Fight Award to winner Lois Weaver, artist, activist and human rights and women’s champion through her performance art. Roshni Goyate and Leyya Sattar – nominated for their work on digital platform, The Other Box, promoting diversity and creativity – saw Vicky Featherstone win the Breaking New Ground Award for her work in theatre, tackling sexual harassment and gender discrimination and launching, ‘No Grey Area’ to help women (mostly but not exclusively) and those in power understand boundaries and protect the vulnerable from falling through them, through no fault of their own. Playwright and actor Ambreen Razia,author of ‘Diary of a Hounslow Girl’, also lost out to Turner Prize winner visual artist Lubaina Himid in the Outstanding Achievement Award’ category, 2016-17.